Most big Ferraris are usually overlooked anyway, deferring to their smaller, faster siblings when it comes to headline-grabbing, but Ferrari’s ’76-’89 400, 400i and 412 (collectively known as the 400-series) were especially demure. A certain flamboyance being a key quality of the brand in general, it’s easy to see why the 400-series faded into the background. Leaving aside the open question of whether an automatic genuinely better matched the big GT’s demeanor than a manual, or if it was just a capitulation to the effort-averse tastes of the all-important American market, I’m convinced the car itself was a diamond in the rough. Especially considering its Ferrari stablemates like the yuppie-ish Mondial or cartoonish Testarossa, the 400-series shone for its conventionality. The Italian automaker had waited until the mid-’70s—the last possible moment—to jump on the mid-engined bandwagon, and it would take the arrival of the Acura NSX in 1990 to convince them that it took more than simply dropping an engine amidships, with little attention paid to driveability or ergonomics, to make a compelling supercar. Thus, in the intervening years, the mid-engined Ferraris were comparatively half-baked, in contrast to a formula the automaker knew and could execute as well as anyone: Front-engined V12 + RWD. 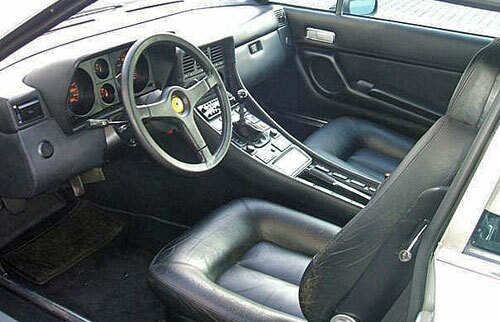 So the 400, 400i and 412 benefited greatly from Ferrari’s mastery of that layout. Indeed, even if the ultimate 412 weighed perilously close to 4,000 lbs, dashing any expectations of a lithe and nimble corner-carver, the chassis was graced with double wishbones all around and delivered as polished—if not hair-raising—a driving experience as any Ferrari had up until that point. Also, even if its boxy, angular lines are resolutely stuck in the ’70s and ’80s, Pininfarina aced its proportions and penned a handsome, somewhat timeless shape that looks smaller than its mass would suggest. No, Ferrari’s 400-series deserves more recognition than it received in its day, and it has all the earmarks of a future classic. However, labelling my favorite Ferrari, the Testarossa as “cartoonish” is just wrong. The correct term is “superheroic”. That’s a gorgeous car. Anyone who says the 400-series won’t ever be a “classic Ferrari” is smoking something. I do wish it was a manual, though. I really do have a thing for big, manual-equipped coupes.